If only Life came with a “pause” button for the times we need to take a breather from the rat race. Or does it already and we just haven’t figured out how to access it? In her new book, My De-Stress Diary – 52 Effective Tips for Less Stress & More Peace of Mind, Dr. Annika Sörensen offers advice on how to manage a multiplicity of pesky stressors that much too often keep us from enjoying – and celebrating – the beauty of the here and now. Q: So how is it that a general practitioner in Sweden’s public health system for 25 years decided to start writing books about stress? A: I was working, and at the same time raising my family of three wonderful daughters, I had the best job in the world meeting all kinds of people, dealing with all kinds of issues and – on the outside – it all looked like the perfect life. But on the inside I felt more and more overwhelmed, I started sleeping badly, nothing was fun and I didn’t feel I could do a good job because it was so much to do and sooo little time. I woke up each morning asking myself if I would survive the day. I was heading straight into depression and I needed help! I realized I had to do something to get out of this so I started to read and take courses in health promotion and stress management. I learned a lot (and it was good for me!) but I also found out so much more I could do for my patients. Accordingly, my work actually got even harder. Looking at my whole situation I found only one way out – to quit my job and start my own business and the topic was easy to define: stress management. In my search for good help, I found lots of books – many were good but they all focused on just one specific issue: how to organize your workflow, how to make lists, how to eat or how to exercise, etc. During my years in health care I have again and again seen that it all connects – you have to look at the big picture to find your optimal next move. That book – with the overview strategy – I didn’t find that out there. So I decided to put together all my 25 years of patient stories, combine it with my medical knowledge and build it into a model on how to tackle stress from a basic point. How to NOT complicate what to do, just keep it simple. How to start to get you as quickly as possible to de-stress. But it is not about a quick fix – they don’t exist. Long story short, I wrote that book that I missed – Take Stress from Chaos to Calm – and made it a workbook to help the reader find the way. And a year later I wrote “My De-Stress Diary” as a complement to the work book. Today I have a happy work life that I love, in my own company AskDrAnnika AND I still have my wonderful family that has been supporting me on this journey all the way. Q: There’s no question there are lots of stressors in our daily lives – the job, the commute, the family, the finances, anxieties about health, frustrations about politics, fears about global unrest. In your view, what’s the biggest cause of all this worry, strain and persistent melancholia? A: The greatest cause of stress related problems and disease is a lack of time for reflection and time for rejuvenation. Q: Why is this area of study and professional practice particularly important to you? A: I have seen so many people with stress related problems and seeing that it can lead to massive illness. And I have found out that it is possible to change the route with simple – but not easy – approaches so I have made it my mission to help business professionals NOT become patients. Q: When I first entered the workforce in the early 70’s, there were plenty of employees around me that certainly fit the definition of ”stressed out.” Supervisors of the day, however, tended to dismiss or trivialize these claims by saying, ”Oh, it’s all in your head” or ”You’re just trying to get out of work.” At what point did society begin to realize there was a correlation between emotional tension and physical illness? A: I would say there was a shift in the early 90’s. That was a time with many big changes in the world economy and in Sweden it was also a big structural change in the public wealth fare systems. People started to get “burnt out” and it became obvious that mental and physical health were connected. Q: Even if someone recognizes that s/he is under a lot of stress, there’s sometimes a stigma attached to seeking professional help to identify what’s causing it and how to make it stop. Accordingly, they attempt to self-diagnose and self-treat. What are some of the biggest mistakes they make when they take this do-it-yourself therapy route? A: The biggest mistake is to start doing random things and whatever pops up or what was good for their friends. That is probably not what they need and they will continue to be just as stressed, if not even more! A: They need to halt and reflect on their total situation, look at all angles, maybe do a mind map. If they don’t have the energy for that, I would suggest starting with some physical activity to get the energy. Q: One of the delightful phrases you use on your website regarding new patients is about taking a ”mental helicopter ride.” How does this approach work and what are the goals? A: On a mental helicopter ride we look at the Wheel of life. My Wheel has eight pieces and work is one of them. The aim is to find happiness at work which will help you achieve more and, in the end, results in higher revenue in your business. 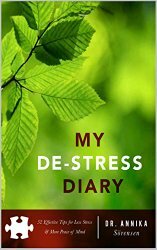 Q: What inspired you to write My De-Stress Diary and who is the book’s target audience? A: My target audience is business professionals – mostly leaders – at all levels. I had already published a structural workbook, Take Stress from Chaos to Calm and all the quotes from that book kept spinning around in my head until I one day just saw the picture of having 52 quotes to make it a weekly diary. One thing leads to the other and I thought of having weekly tips – and voila the idea was born. Q: What are some ways that readers can use your book effectively? A: I suggest reading one quote/tip a week, reflect on that, document your thoughts, implement and get things going. Since the tips are so different, you can have more than one subject working for you at the same time. You definitely don’t need to work with the tips in the given order; personalize for your best needs. Q: What’s your primary takeaway message for the book and also for your professional work? A: Always first look at the whole picture because it is about all angles in your life. Pick your way, take one step at the time, make it simple – don’t overcomplicate things. And it doesn’t matter where you start as long as you do something. Q: Do you have any favorite stories to share about individuals that have come to you for assistance to quell the destructive stressors in their lives? A: It is about my client Lars. He felt lost. Business was going down. He was even thinking about getting a pay-job again because he felt at a dead-end with his own business. So we did an inventory in his life using my mentoring program. Most things seemed okay but he was generally annoyed and he blamed all and everything. As he worked his way through the program, he did some minor tweaks BUT it was not until he looked into his personal life he suddenly saw clearly that he had a hang-up with his mother in law…… no details – but when he dug more deeply it showed to be a silly misunderstanding that had started it all two years previous. He looked at his alternatives for a solution and decided to give her a big bouquet of flowers and talk about it – and voila – they could laugh about the mistake and he was at peace and got new fuel to continue his own business that now is flourishing. Silly isn’t it that just a small thing can destroy so much and we don’t take the time to reflect and sort things out. Q: What do you to de-stress yourself and maintain a state of calm and balance? A: I always try to get enough sleep – that is the ultimate source of life. I also mostly eat healthy food. I take daily walks and I have an alarm set to make short breaks every hour, sometimes just a one minute stretch of my body. I also am very careful about taking some time off if I feel things start getting out of hand – the sooner I rejuvenate, the shorter time I need. Q: If your philosophy of living well were printed on a t-shirt, what would it say? A: Get back to basics and don’t complicate life! A: I am very good at textile handicraft, sewing, stitching and especially hand weaving. I have a large handloom in my basement! My choice back then was between Textile and Medicine. Q: If you could give just one piece of advice for quick relief in a stressful situation, what would that be? A: A simple tool. It is the breathing anchor. It is a tool to use every time you feel the stress creeping up in your body. Sit/stand straight, with feet steady on the ground. Close your eyes if you want. Take a deep breath in, through your nose, letting your stomach out, hold the breath for a couple of seconds and breathe out slowly through your mouth and let your shoulder down. Do it again – in – hold – and out. This tool has two main effects – first, while you think of your breathing, your brain can’t think of your problems at the same time; that gives your brain some micro time to distance from your immediate response to a stressor and the stressor get a little bit less dangerous. Secondly, your brain gets more oxygen and that makes it think more clearly which also makes your stressor seem a bit less dangerous. And keep on practicing! After a while it will be automatic and you have given yourself something really good. A: I am in the process of making an online course of my mentor program “Go from Stressed to calm – 8 easy steps to regain control of your life!” The program is based on my first book, Take Stress from Chaos to Calm. In the program I virtually hold hands on the helicopter ride and then help my clients to sort things out and find their unique way out of it. A: You are the only person that can change your life – what do you want to change? Q: Where can readers find your book and learn more about you?